One of the problems ABAP developers face from time to time is the need to store arbitrary values for processing. These values do not always justify creating a new table, and there is no convenient place to store such values. An example would be when some logic depends on a master data value (like a certain customer), or if the developer provides some tool that provides some customization options which need to be saved in an unstructured manner. In cases where creating separate config tables are not warranted, developers often come up with creative ways to store values to avoid hard-coding them, such as writing entries to TVARV. However, this is not a very neat solution and sometimes leads to awkward workarounds for more specific sub-cases, like inventing conventions for putting composite keys into the name. The solution I am presenting here (see below for a link to the source) consists of a hierarchical value store, not unlike the Microsoft Windows Registry. It allows the developer to retrieve and store values that cannot neatly be associated with some configuration and which does not warrant the creation of a new table. The store is backed by the table INDX, which you will find standard in every ABAP installation and which is accessed conveniently with the statements EXPORT TO DATABASE and IMPORT FROM DATABASE. There is of course no reason not to use a custom table for this, but using INDX avoids you having to create yet another table; although if you are worried about keys colliding with other entries in there, you can simply use search-and-replace to specify your own table. Additionally, there is some concurrency control in the form of optimistic locking, though I am not entirely sure whether there is a practical need for it. Adding new entries (keys) to the registry causes the new entry and the parent entry to be saved immediately, while values in each entry must be saved explicitly (although they will be saved automatically when making changes to the entries; I am still thinking about auto-saving all changes). DATA: reg_root TYPE REF TO lcl_registry_entry. DATA: reg_entry TYPE REF TO lcl_registry_entry. * to ensure it is bound. reg_entry = reg_root->get_subentry( ‘Sales’ )->get_subentry( ‘Enhancements’ )->get_subentry( ‘Process_XYZ’ ). lv_customer = reg_entry->get_value( ‘ProcessCustomer’ ). 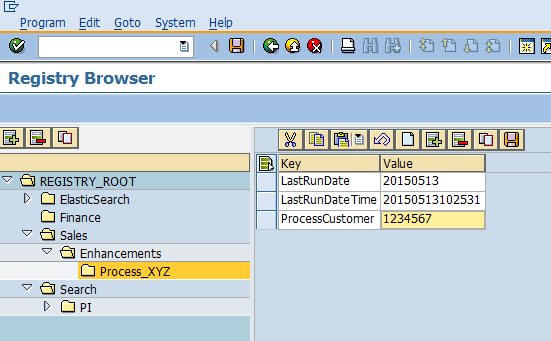 reg_entry->set_value( KEY = ‘LastRunDate’ VALUE = lv_run_date ). reg_entry->set_value( KEY = ‘LastRunDateTime’ VALUE = lv_timestamp ). thanks for the registry lib and the blog. I created several “settings tables” in the past. I think one hierarchical registry is a better way to store our settings. I noticed that registry path names may not contain digits. Did you exclude digits intentionally? No, the omission of numerical digits was an oversight. Thanks for pointing it out; I have changed the code on the Gist. I’ve been using mostly custom tables & constants of global interfaces (according to the purpose), but this is a way more elegant and flexible tecnique.